Classic Monsters The Wolf Man (1941) Ultimate Guide - Chaney & Ankers! 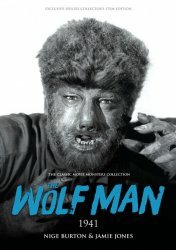 MyMovieMonsters.com > Monster Magazine Marketplace > Classic Monsters Of The Movies (UK) > Ultimate Guides > Classic Monsters The Wolf Man (1941) Ultimate Guide - Chaney & Ankers! Direct to MyMovieMonsters.com from the creators of Classic Monsters of the Movies magazine in the United Kingdom: The Wolf Man 1941 Ultimate Guide evokes the brochure you might have bought at the cinema in 1941! It is a luxury magazine dedicated to the Chaney classic. We ship same or next day so don't wait for the UK! This book, the third in the Classic Movie Monsters Collection, celebrates George Waggner's seminal 1941 movie The Wolf Man, the film which created the first new Universal monster for ten years, and made a star out of Lon Chaney Jr. Called simply The Wolf Man 1941, this guide is beautifully written and illustrated with a wealth of photos and posters. Author and horror film historian Nige Burton traces the story of Universal's celebrated masterpiece, which is still revered today for its faultless performances, stunning camerawork and Jack Pierce's revolutionary make-up. Within these lovingly designed pages you'll discover the backstory behind one of horror cinema's most beloved monsters, as well as the diverse stories unfolding behind the scenes, and cast and crew biographies. The Wolf Man 1941 is the perfect reference guide for any fan of this highly respected Universal classic. Collectors Note: The publications produced by Stripey Media Ltd., including this Ultimate Guide, have set a new standard for quality. The images posted to our website simply do not do these gems justice. All photos are crisp, pages are colorful, and even the covers on the guides feature spot varnish to make cover elements pop! These are a must for any monster magazine collection. While supplies last we also offer issues of Classic Monsters of the Movies magazine, additional Ultimate Guides, and The Monsters" Day-By-Day Almanac. Want this Ultimate Guide as well as the Mummy Guide? Use the handy Buy Both button below! 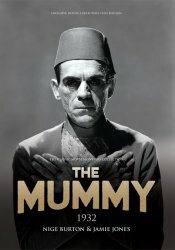 Classic Monsters The Mummy (1932) Ultimate Guide - Boris Karloff!